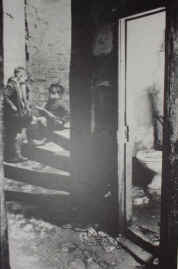 Tenement buildings overrun with mice, we lived in a three storey tenement and as the area was being demolished we and another family were the only two families left in the close. Mice were everywhere, running up the curtains while you watched TV, the frying pan had mouse footprints in it, we had to chap the door before entering a room to hear the mice scurrying across the floor, mousetraps and wharfen poison everywhere. Remember the sticky orange flypaper? It came in roll, looked like a camera spool. landed oan it.....it was stuck! Ye ended up wi a flys graveyard. well you know what for! just a single room to live, sleep and eat in. Single-end.houses overcrowding....I stayed in a single-end house in the close with my sister and parents all of us sharing the bed which was in the 'bed-recess' being the oldest I got the 'feet' end. The house being freezing in the morning and having to "kennel" the coal fire! which end he wanted to sleep at he said " the shallow-end! " No Central heating ice on the windows....on the inside! Having to go to Crail St., Florence St., or Redan St. clinics to be cured for impitigo. and how everyone called you scabby heid. The dreaded Scabies, which, regardless how clean your family were you just picked it up and imposed it upon your household. Again we would visit one of the above clinics to strip naked, and be doused over with a white liquid put on with a large decorators paint brush, a dreadful and embarrassing experience. Remember the unfortunate children at school who had a 'lazy' eye and having to wear specs with one lens wrapped in elastoplast! Puddles... playing wi the water and drinking it! seen these bottles being used as missiles, raining down on fellow supporters! Extract from e-mail 22nd Nov.2002 (name withheld) Regarding your comments about football matches and bottles filled with urine, I remember as a ten year old going to Celtic Park, an' being 'lifted ower' by a decent supporter, to collect empty bottles for returning to the shop/pub for refunds. On finding a half filled 'ginger' bottle with what in my childhood ignorance I assumed to be 'ginger' I asked the man standing there "haw mister, is this ginger?" Which he replied, "yes". What luck, I took a slug only to find it filled with pee! This is an experience of abuse which I clearly remember to this day. When they stand before the pearly gates there are many in this world who have much explaining to do for their mistreatment of weans. major city and Glesga is nae exception! alcohol and the bevvy ruined them. or having to scrape it off yer shoe on the pavement edge. A wee boy walked in tae his hoose, an he hud a big jobby, in his haun, an he says tae his maw Hey, Maw dae you know ah' nearly stood oan that!! Packs of dogs roaming the streets and sometimes needing a well aimed bucket of water thrown over them! If ye get ma drift! Weans wi' snottery noses, I knew a wee boy in Brigton who always, always had a snottery nose.....various colours. Incidentally, when people blow their noses then look into the hankie..what do they expect to find? A silver sixpence! Whit can I dae aboot this continual dreepin’. Frae my nose a’ the day even when I’m sleepin’. The Doctor says he can dae naethin’ aboot it. He says it’s no’ like somethin’ ye can take it oot an’ shoot it. I went tae the Chemist tae pick up my prescription. An’ afore I went in, I gave my hooter a guid blow. But as I bent o’er the coonter tae sign my description. Watter frae the well o’ my nasal canal began tae flow. The wee lassie wis awfy guid an’ didnae make it an issue. She jist went roon’ the back. An’ when she came back. She geid me a big paper tissue. In the Post Office oot o’ the rain. An’ I noticed my sleeve wis a’ damp. Wi’ wipin’ the dreep as I walked doon the street. It wis handy for stickin’ the stamp. It’s no’ bad today, noo I’ve found a way. A guid way tae kick it....I jist lick it. Polis booking ye for playing fitba in the street! Annoyed me this one as me and my pals had to go to Tobago St Police station for a verbal warning from the Superintendent.....meanwhile the real neds were running around fighting, stabbing and breaking into houses! Running at each other with blades, slashing faces and kicking lumps out each other. watching these mindless morons chase each other up and down Baltic Street. prevalent when the letter arrived informing the family that they had to move as the building was being demolished. We ALL wanted to stay! Webmaister :- Any more? Send me an e-mail. I have tried to lighten this page with a wee bit of humour but lets not forget we did live in some appalling conditions. I hope we are all the better for it. I have just been reading thru the 'Alternative memories' The Webmaister should be complimented on including this on his site. Many of us, especially ex-pats, tend to look at days gone by thru rose coloured spectacles...'The good old days...that never really were'. 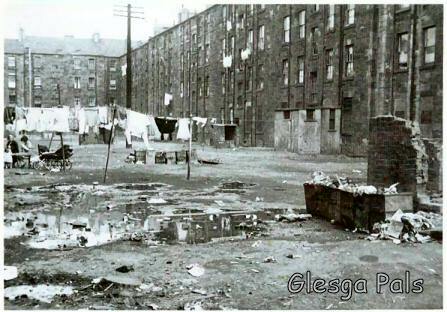 To forget the hardships and struggles our parents went thru, the terrible slum conditions...just to survive, put food on the table, in the 'Old Glasgow', is to demean their indomitable spirit TOO SURVIVE. 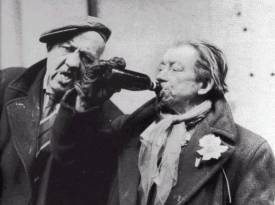 Glaswegians have one supreme quality, that helped the past generations survive those days and is still present in todays generation....a great sense of humour and an ability to laugh at themselves.
" ....have you all read " alternative views in memory lane" I just did, and I must say I'm glad that I did, I did not have the misfortune to live they way some people had to, but I do know that all that is written is true, and we should be thankful that things have changed at least for some folks, the thing that has bothered me for a long long time, is the way they have let the drugs get out of hand, there are so many people affected by these things, even if they don't indulge themselves, but as usual the government is 40 years too late in trying to do something about it....... anyway just thought to say when you hear the stories YES it was not all good times back then, and good on Wull the Webmaister for adding it to the website"